What would your child do if your child’s clothes caught fire? Or if he was trapped in a room on fire? Will he be able to save himself? Keeping this in mind, Dubai Civil Defence will start training private school students on what to do in case of an emergency. 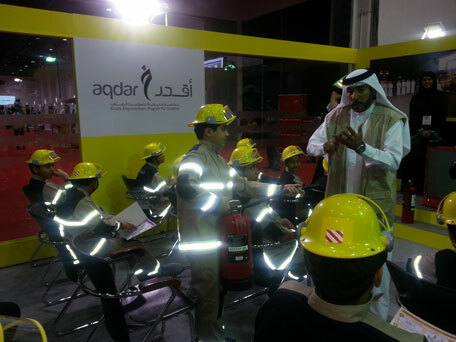 In a special programme launched in 2011, Dubai Civil Defence started training government school students in Dubai on how to act if they got stuck in a place which was on fire. Speaking to Emirates 24|7, Abdulla Hamza, a lecturer at Dubai Civil Defence said that they started this programme with the aim of raising awareness among school students on how to act and save their and others lives. He pointed out that in each class, these two students will play a major role in managing emergencies such as a fire or smoke resulting from fire. The programme was so popular that many private schools started asking to get the same training in their schools, and this is going to start by the beginning of the next academic year in September. Emirates 24|7 also spoke to a group of students who are members of Dubai Civil Defence Club, and they said that they benefited a lot from the training. Ali Mohammed, a student from Ahmed Bin Rashid School in Dubai said that he learnt how to hold and use different types of fire extinguishers. “We learnt how to save the situation,” he said. He added that also learned that if his clothes caught fire, the first thing he must do is to cover his face with both his hands and then lay down on his back and roll on both sides to put off the fire.